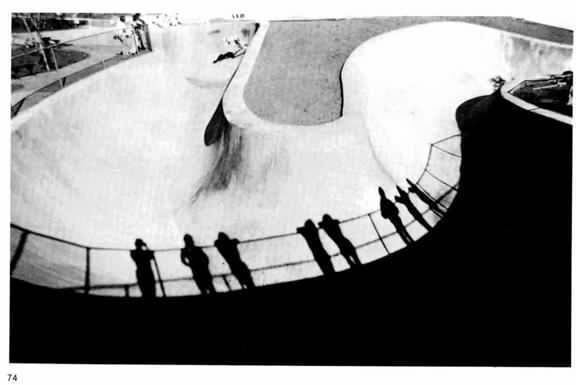 This story and included photos were scanned from an old copy of Skateboarder Mag, dated May 1978 and are displayed here for educational purposes only. Photos by Ray Allen . c. 1978 by Skateboarder Magazine, and/or Ray Allen or affliated groups. All rights reserved. These pages have been reformatted for the web presentation. 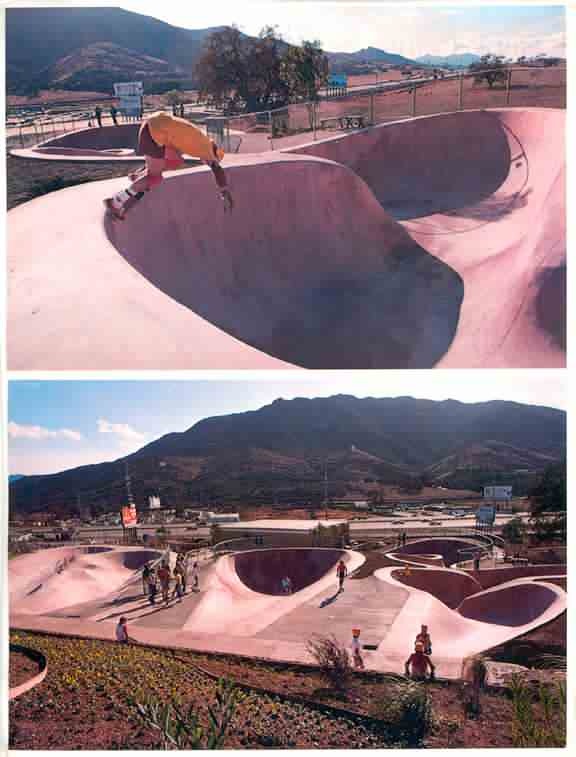 Aloha Skatetown, Agoura, California, is most obviously unique in its use of tinted shotcrete. A "Sunset Rose" color is used to minimize glare in the four runs, as well as for "product identification" , (The latter reasoning explains the present tan walkways and the planned green separation strips.) The runs themselves are cut along the side of a hill, allowing sufficient momentum throughout. The 430' advanced serpentine, a "Grand Canyon" run, for instance, cuts like a bobsled course through seven bends of up to 13 1/2 ' in height. Alongside is the 30' by 80' "Whale Bowl" with walls varying from 45 degrees to vertical. That, in turn, is neighbored by the shallower "Spaghetti Run" and "Wallos," respectively 125' and 120' in length.